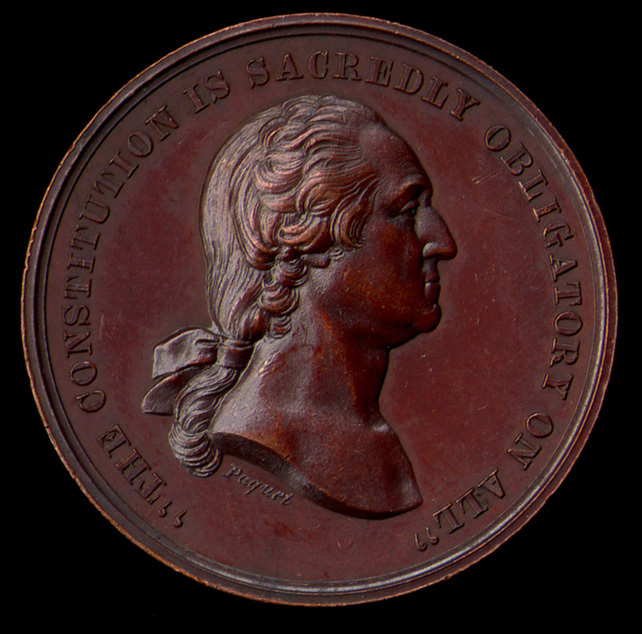 Obverse: GEORGIUS WASHINGTON PRÆS. PRIM. RER. CONF. AMER. MDCCLXXXIX [below bust] LOVETT / PHILA. 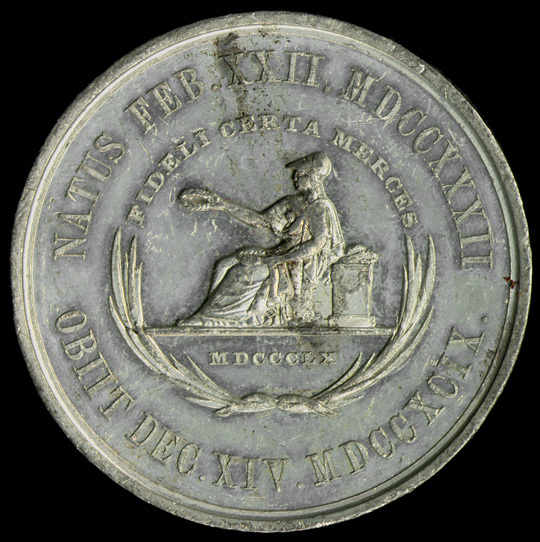 Comments: A large medal engraved by Robert Lovett, Jr. of Philadelphia in 1860 and issued in bronze, brass and white metal; there is also a unique silver example and a few die trial pieces in lead. The obverse shows an undraped bust right portrait with a Latin legend translated as "George Washington first president of the united states of America 1789." In this phrase I take the Latin rer. conf. to be abbreviations for rerum (things) and a form of confero (to bring together) referring to states rather than confederatio for what would be the anachronistic (or pre-federal) term Confederation. The reverse shows the seated goddess of wisdom Minerva (Athena in Greek mythology) extending a laurel wreath (symbolizing victory). The inscriptions are in Latin. Above Minerva it reads, "Certain reward to the faithful (or loyal)" while below her is the date 1860. In the outer inscription are Washington's birth and death dates, "He was born Feb. 22, 1732 / He died Dec. 14, 1799." Reference: Rulau and Fuld, p. 110. Comments: Lucius Quinctius Cincinnatus was a prominent Roman citizen during the early Republic. In 458 B.C. he was appointed dictator by the Senate so he could command the army against the Aequi. After defeating their enemy in sixteen days Cincinnatus resigned his post and went back to farming. Later in 439 B.C.he was again given full dictatorial authority to put down a plebeian revolt, which he once again resigned after completing the task. 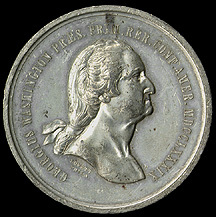 The medal shows a bust left portrait of Washington in military dress on the obverse and two joined palm branches in the shape of a wreath on the reverse. The dies for this undated 31mm diameter medal were designed by George Hampden Lovett of New York City and issued in silver, brass, copper and white medal. 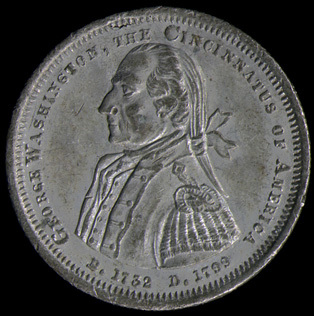 Rulau and Fuld state this medal was struck in 1860 but attribute all other varieties of the Cincinnatus obverse (all of which are 32mm) to 1861. These other medals, all attributed to George Lovett, include: Baker 277, which had a reverse consisting of a circle of 35 stars and the motto THE UNION MUST & SHALL BE PRESERVED; Baker 278, which replaced the stars with a radiating all seeing eye but retaining the motto and Baker 278F, which joined the Cincinnatus obverse with a reverse containing a sheaf of wheat inside a circular wreath made of wheat grains. 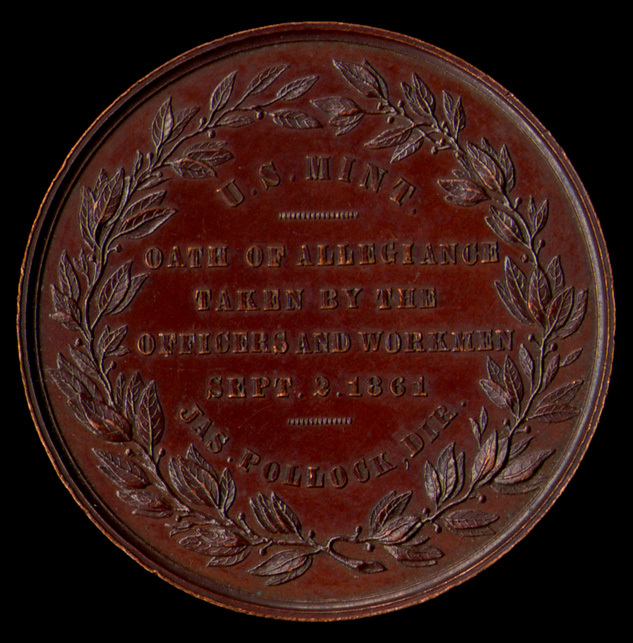 The Cincinnatus obverse was also used on Baker 529, a storecard for John K. Curtis of New York City, this storecard is dated 1861 and is the only Cincinnatus piece to contain a date. The Curtis storecard is known as Miller NY 171-174, these are all the same storecard but with a different number for each different metal. [note: other Curtis storecards as Miller NY 175-178, dated to 1860, have a different obverse but use a very similar reverse to NY 171-174 and are signed GHL]. References: Rulau and Fuld, pp. 123, 164 and 263; Rulau, Standard Catalog, 3rd ed. p. 237; Baker, p. 147. 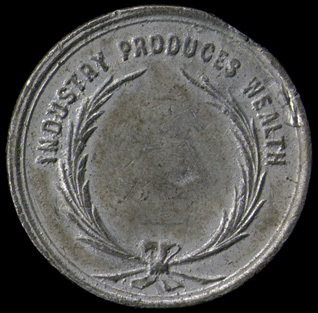 Reverse: U.S. MINT. / [row of 17 elongated dots] / OATH OF ALLEGIANCE / TAKEN BY THE / OFFICERS AND WORKMEN / SEPT. 2. 1861 / row of 14 elongated dots] / JAS. POLLOCK, DIR. 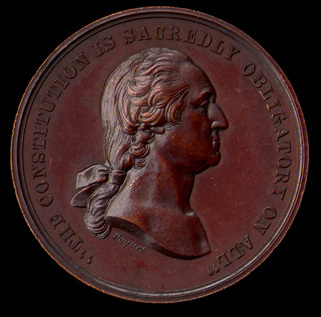 Comments: This medal was designed by the engraver Anthony C. Paquet and struck at the Philadelphia mint to commemorate the completion of the requirement that all mint personnel swear an oath of allegiance to the constitution. The requirement was completed about five weeks after the union defeat in the first battle at Bull Run (July 21, 1861). 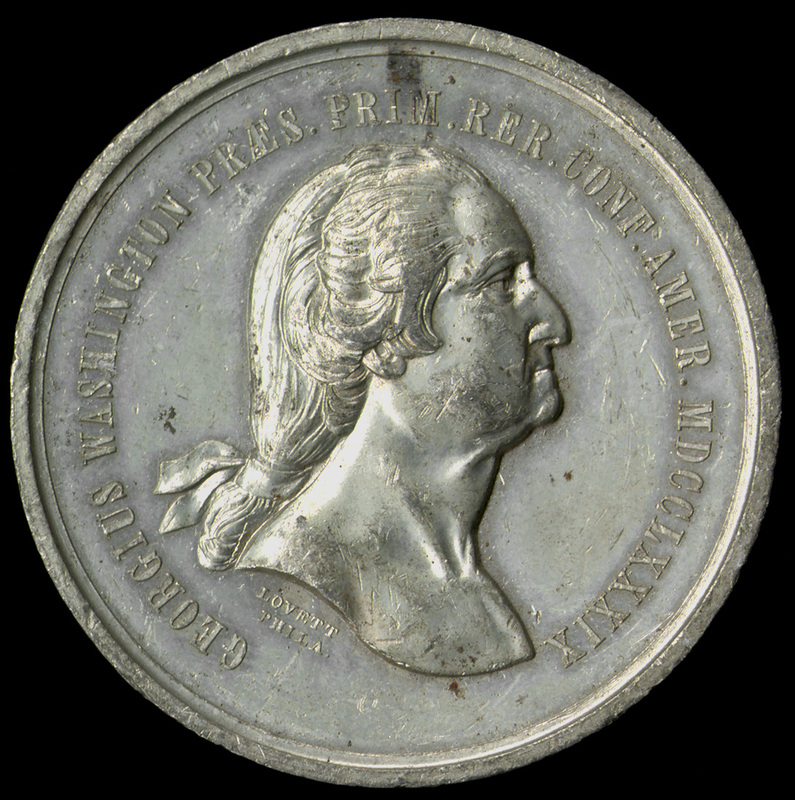 The obverse displays an undraped bust right portrait of Washington while the reverse has the legend within an olive branch wreath. 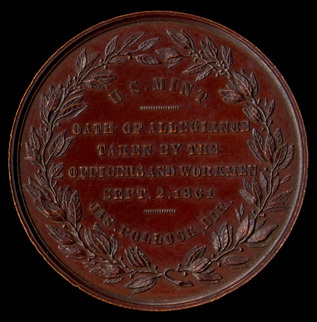 This medal was issued in 1861 in silver, copper, bronze, aluminum and yellow metal. A yellow metal restrike is still available from the mint. There is also a very rare variety found in both in silver and bronze which as a reverse consisting of a wreath tied with a bow at the bottom and a blank field without a legend. Reference: Rulau and Fuld, p. 123.